The 7th of July would be a day the Moth family would not forget in a long time. Albert Victor Moth, was the son of Shadrach Moth and his wife Sarah nee Cook. He was born in Manchester. By 1911 he was one of 8 surviving children living at 50 Bosworth Street, Openshaw, Manchester – a six roomed house where 10 lived. His father worked as an iron founder at the local waggon works and 12 year old Albert attended school. Albert enlisted in Manchester, joining the King’s Own Royal Lancaster Regiment – Private 3571. The Service Record for Albert survives and one page tells that he was wounded in action on the 4th July and transferred to 76 Field Ambulance. Warloy-Baillon during the early part of 1916 had become a popular billeting area, with the hospital there at the time specialising in abdominal and chest cases. By the summer of that year the 76th Field Ambulance was in the village – some said that the 76th should have been run as a base hospital and not by Field Ambulances. On 2nd July, the situation at the hospital was said t be chaotic, with ‘too many wounded unable to be evacuated’, lying outside the tents. The 76th FA was taken over by the 92nd Field Ambulance, the original medical officers slowed their working pace, their commanding officers being overwhelmed with paperwork. The 92nd marched out on the 5th July leaving everything in disarray and dirty. 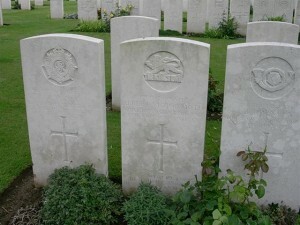 Albert died of wounds on the 7th July 1906 aged 17. He rests in Warloy-Baillon Communal Cemetery Extension with over 1300 other identified casualties including 18 German casualties and two Second World War casualties. This entry was posted in General, News on July 7, 2016 by carol.